Interested In Performing For Paradise? David Aman – Maestro Hombré! David grew up in Italy and Spain and studied Spanish guitar in Madrid. A lover of classical Baroque music, he moved to London in 1992 and performed throughout England for two years. Moving to Texas had him fall in love with Latin music of all types from Mexico to Venezuela to Brazil and of course the music of Spain. Having been lucky enough to live all around the world, David is proud to call Delaware home. Lima Bean Riot one of Philadelphia’s most sought after cover bands!! LBR is a Modern Rock Band from Delaware County who will promise to keep you dancing and singing until early hours of the morning! With five amazing and completely unique personalities, LBR can provide any type and style of music-Classic Rock, R&B, Pop, Hip Hop etc. Garden State Radio brings the ultimate audio/visual EXPERIENCE!!! Their signature performances will have every person in your venue not only hearing the music, but seeing and feeling it as well. With a massive state of the art light show that is perfectly sync’d to their musical performance, the band plays everything you know and love, bringing to life the biggest multi- genre anthems of the 80’s, 90’s, 2000’s, and today spanning four decades of music. They mashup and medley a wide array of songs like a world class DJ, while also combining costumes and theatrics for a one of a kind, electrifying live EXPERIENCE. “The vocal performance is ebb and flow, melodic, passionate, smoky, powerful and intense. She has been performing and continues to around and about at venues, social and community events. “On a mission to bring The Fun wherever they play, this five-piece band pumps rhythm through its audience like blood through the veins. With Rob Eelman fronting the band, Matt Lindia on vocals and guitar, Jay Cagna on bass, Jaymz Ruggiere on lead guitar and Joe Russomano (of STOMP renown) pounding the drum skins and cymbals, Temporary Grace delivers the fix that you’ve been jonesin’. LIGHTS, CAMERA, COUNTRY! Tired of cover bands being human juke boxes, then come see a real show. Triple Rail Turn the areas only real country EXPERIENCE. Mike Hines and The Look, is a high energy dance band who can bring any party to life. They play r&b, hip hop, pop, old school funk; along with a small taste of Motown and disco. Mike Hines and The Look frequently performs at night clubs, weddings, festivals and private parties and they always get the crowd involved. They’re the ultimate party band, with a very diverse following from several generations. When they play, nobody sits down. Every Sunday Come Jam Out With Local Legends "Love Seed Momma Jump Trio"
Phillip Michael Parsons spent the last four years building a fiercely loyal fanbase and the newest members of the “PMP Fam Club” are streaming in from coast to coast. Yes, that said “Fam Club!” Parsons has been referring to his fans as “family”since day one. His Fam club, one month after forming has members from 26 states, Canada, Australia, Europe and South America! Parsons plays an active role on social media and looks forward to meeting new family members through his upcoming national radio debut and an ever increasing inclusion on worldwide Spotify playlists. Parsons’ plans for his most extensive tour yet are all sure to provide optimal growth in 2019. His dynamic, high-energy performances with a skilled and young close-knit band of professionals never disappoints and instantly draws and entertains crowds of up to 40,000! Equipped with a state of the art AV/light show and a set list that delivers nothing but the hottest NEW music, this male/female co-front is backed by some of the finest musicians on the scene. The collective chemistry and energy of this talented five piece will result in a packed dance floor!!! Bob Lougheed And The Memphis Mafia Tribute to Elvis Monday May 27th 4-8pm! Fuzzbox Piranha is a classic rock cover band experience of a lifetime!! A True Rockers Jam session!Be ready to jam out with Fuzzbox on our Paradise beach stage on Friday May 31st!!! Country Artist, Rocky Allen, has had his fan base grow exceptionally as he has performed in Delaware, Iowa, Kentucky, Maryland, New Jersey, New York, North Carolina, Ohio, Pennsylvania, South Carolina, Tennessee, Virginia, and West Virginia. Southern Delaware’s up and coming country/rock/mix/original band playing a variety of old, new and current music sure to please all music lovers. Nashville Recording Artist/Singer/Songwriter from Lewes, DE, Sara Ann has been performing since the age of 3 years old. She opened for Country Music greats such as Jon Pardi, Dorado Band (formerly Chasin’ Crazy), Waterloo Revival, Brandon Ray, Kalie Shorr and performed on the Next From Nashville stage at the 2015 Delaware Junction country music festival which opened the day to country artists Colt Ford, Lee Brice and Toby Keith. Sara Ann has performed at DBMC (Dewey Beach Music Conference), the Country Americana Festival, Delaware Music Festival, 2017 Ladybug Music Festival, 2015 Cape May singer/songwriter conference, 2015 Headliner for Country Con Festival (WBKR – Town Square Media). She has entertained audiences in Nashville, Kentucky, Georgia, Florida, Pennsylvania, New York, New Jersey & Delaware. She is currently touring in the Northeast promoting her EP “Livin’ a Dream”. ​In 2018 Sara Ann joined The Highway Women, a Nashville based All Female Band. The Highway Women are currently recording their first EP and working in development in preparation for their 2019-2020 National Tour. Mathew Street is a Classic Rock Band based on the Delmarva Peninsula. Four musicians who Drag The Party Out Of You! Big Bang Baby is a high profile group of the most well respected musicians and entertainers which creates the best well rounded act for any style or event . GARDEN STATE RADIO create the ultimate audio/visual EXPERIENCE. Their signature performances will have every person in your venue not only hearing the music, but seeing and feeling it as well. With a massive state of the art light show that is perfectly sync’d to their musical performance, the band plays everything you know and love, bringing to life the biggest multi- genre anthems of the 80’s, 90’s, 2000’s, and today spanning four decades of music. They mashup and medley a wide array of songs like a world class DJ, while also combining costumes and theatrics for a one of a kind, electrifying live EXPERIENCE. Get ready for sensory overload, Get ready for GARDEN STATE RADIO. Jumper makes there long awaited Paradise debut on Sunday June 9th from 4-8pm! Jumper is a High Energy Cover Band From Philadelphia covering all the Top 40 hits from the 60’s to Today that will make you wanna jump up and dance! Equipped with a state of the art AV/light show and a set list that delivers nothing but the hottest NEW music, this male/female co-front is backed by some of the finest musicians on the scene. The collective chemistry and energy of this talented five piece will result in a packed dance floor! 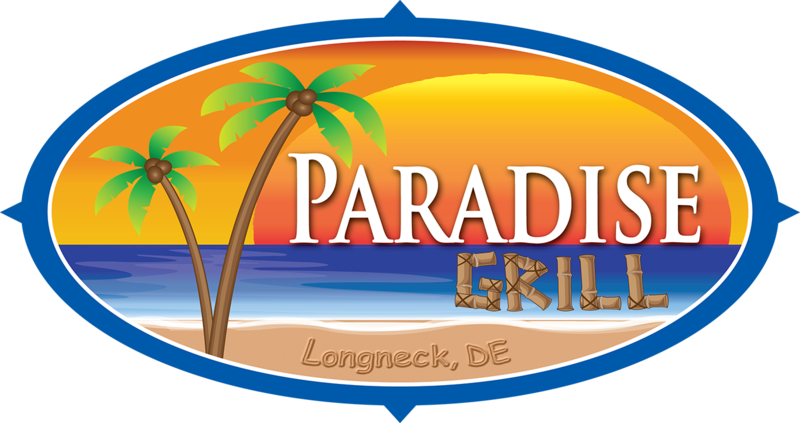 Electric Beach returns to Paradise Grill Saturday June 29th! The Fabulous Greaseband returns to Paradise Grill on Sunday May 19th! Celebrating 45 years strong the Greaseband will play all of the classics and party songs from The 50’s,60’s,70’s, and 80’s!!! Be Sure To Join us on Sunday May 19th from 5:30-9pm!! As for his music, Brian says he doesn’t want to be pigeonholed to a certain genre. “I grew up on all types of music, I love it all, so I’m going to do it all!” “I hope people love what they hear, weather its a rock song, dance track or a sad country song, I just love making music!” “Making music should be nothing but fun with a sprinkle of more fun with no rules.” After all, McConnell adds, “Innovator’s don’t play by rules! Four out of the original six of the members of The Amish Outlaws were born and raised in Lancaster, PA and had a strict Amish upbringing. No electricity from land lines, no alcohol, no musical instruments, but their spirits were too wild for the Amish lifestyle. Once they trampled in the Devil’s Playground, there was no turning back. In the years since Rumspringa, the members of the Amish Outlaws have become very well acclimated to the pleasures and vices of the modern world… music, most of all. Audiences everywhere have fallen in love with Kristen & The Noise and the band has become the standard of excellence in every major music market. Their songs range is limitless with Kristen’s voice, and they cater to any type of crowd with Top 40 Pop, R&B, Oldies, Classics, Rock, Hip-hop, etc. They’re one of the rare bands that can truly perform any genre. Jumper returns to Paradise on July 7th from 5-9pm! Jumper is a High Energy Cover Band From Philadelphia covering all the Top 40 hits from the 60’s to Today that will make you wanna jump up and dance! Weird Science is a non-stop hype, energetic, and interactive party group. This professional troupe performs all of the chart topping hits spanning the 80’s, 90’s & Pop2k. Weird Science consists of four members: Myndi Lauper, Willy Idol, LL Cool K and C.C. D’Skillz. Fronted by both male and female vocalists, Weird Science features top level entertainers including powerful keyboards, screaming lead guitars, thumping bass lines, and tight percussion. Each show includes elaborate costumes, detailed lighting, and mind-blowing audio visual enhancements that have to be seen to be believed! LIVE WIRE offers the most complete and authentic reproduction of AC/DC’s sound and stage performance in the world. LIVE WIRE’s live show is the most accurate duplication of the original band that AC/DC fans worldwide have come to love. LIVE WIRE emulates the pure essence, power, and electricity of what an AC/DC show is all about and has proven to audiences time and time again that you can’t stop rock ‘n roll. High Voltage rock n roll at it’s best. Johnny Cash, Waylon Jennings, Adel, Bruno Mars, Hank Jr., Hank Williams , Aretha Franklin, Frank Sinatra, Alice in Chains, Patsy Cline….and more! The Fabulous Greaseband returns to Paradise Grill on Sunday May 19th! Celebrating 45 years strong the Greaseband will play all the classics and party songs from The 50’s,60’s,70’s, and 80’s!!! The Fabulous Greaseband returns to Paradise Grill on Sunday May 19th! Celebrating 45 years strong the Greaseband will play all the classics and party songs from The 50’s,60’s,70’s, and 80’s!!! Be Sure To Join us on Sunday May 19th from 5:30-9pm!! Tournament dates are Wednesday, August 14th – Sunday, August 18th 2019. You may fish 3 out of 5 days. • Registration will be held July 29-Aug. 11, 2019. • Captain’s meeting will be on Tuesday, August 13th at 7:30pm in the Lagoon Area. • This will be a flounder tournament only and you must fish on a registered team/boat. • You may have up to 8 registered anglers on your team with one being registered as the Captain. Everyone on the boat must be registered, no exceptions! • Each team will receive 2 Lay Day Cards to present the 2 days you do NOT fish, or you may use our Lay Day email system for those 2 days. • Each team is eligible to win one prize in the top 10 overall. • Each team may also win one prize in the daily Calcutta each of the 3 days you fish. • The Captain from each team is only entitled to weigh one fish per day and it is his/her responsibility to bring the heaviest fish to the scales. • You may fish in both Delaware and Federal waters. ****NEW THIS YEAR****You may only fish 50 NAUTICAL miles from the Indian River Inlet Green Buoy #1! Any fish caught outside 50 NAUTICAL miles will be immediately disqualified! • Winning flounder are determined by weight, in the event of a tie, length will be used. Each captain is eligible to weigh 1 flounder per day. The flounder must be weighed the day it is caught. • All fish must be landed using rod and reel, hook and line. You must land, hook, and fight your own fish. Another angler may net your fish, however no gaffing, must use net! • Anglers must comply with all Federal and State of Delaware laws regarding size and number of flounder caught. The Department of Natural Resources sets the minimum size requirements for recreational summer flounder each year in Delaware. • Lines may enter the water at 7am each day. • Scales open at 4pm each day in the Lagoon Bar Area. • Lines must be out of the water by 5pm. • You must be back to Paradise by 6pm. • You do not have to come by boat to weigh-in. • A team may use any means to make their fish available for weighing. This includes but is not limited to switching his fish to another boat, being towed by another boat, or trucking the fish to the scales, however, you have to be in the Paradise Lagoon Bar by 6pm! Once the switch has been made, no team member may fish the remainder of that day.